The Shadyside Presbyterian Church building is listed on the National Register of Historic Places as a prime example of Richardsonian Romanesque architecture. Our church history is rooted in the tradition of building Christian community. In the mid-19th century, when Pittsburgh was earning its title of “The Smoky City,” the visionary Thomas Aiken began development of a large, wooded parcel of open land outside the city with a church at its center. His vision of a community-centered church actually began as a “special mission” of East Liberty Presbyterian Church, a Sunday School conceived in 1860 by Aiken and William B. Negley to serve children of the twenty families then living in the heart of the new little neighborhood of Shadyside. This fledgling church community began to hold informal cottage meetings in neighborhood homes, quickly grew and moved to the larger neighborhood railroad station, and soon determined to build a single church for the whole community. 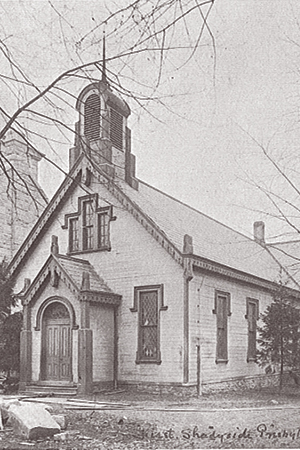 By 1866, Shadyside Presbyterian Church was granted its charter and began construction of its first building on the site of our present chapel, a wooden church with pews for 375 people. Within five years, the congregation had outgrown the little church and built a new Gothic stone church, which also proved too small after nine years. In the face of that growth, the present church was constructed and dedicated in 1892. Our treasured Richardsonian Romanesque landmark has since been enlarged time and again by the organic additions of wings, halls, and cloisters – all of which maintain the integrity of the original structure and style. For more than 150 years, the people of Shadyside Presbyterian Church have been gathering together to worship, growing together in faith, giving generously of themselves to share the grace of Jesus Christ with others, and engaging in Christian fellowship with each other. This is the history of Shadyside Presbyterian Church – a story that continues today, and a community of which you can be a part. Shadyside Presbyterian Church has published two books by author Timothy C. Engleman which explore the church’s history and architecture in depth. Both are available for purchase through the church office; please read details on this page. Further historical information is available in several volumes of church histories contained in the collection of the Walton Library (located on the church’s lower level). A brief visual journey of faith, a DVD titled Through All the Circling Years, is also available to view. To see a list of former pastors, please click here.